Today I would like to bring your attention to a unique new shopping site due to be launched later this year. The company contacted me earlier this week to tell me a bit about themselves and afterwards asked if I would be interested in spreading the word about them. Now, I wouldn't do this if I were not genuinely excited with what they had to tell me. Mallzee is a new 'social shopping experience' launching later this year. The Mallzee experience is designed to enable users to create their very own shopping Mall (Mallzee). Hand pick your favourite beauty brands, fashion stores and have them all under one roof - well in a sense. The Mallzee software finds products that match your personal style thus showcasing them within your personal 'Mallzee'. This will be a fun social experience and you can invite your friends to 'visit your Mallzee' through the use of Facebook chat. You can discuss your favourite beauty and fashion loves and loathes - you can even 'star' items you think your friends would like. If you are unsure of an item and want your chum's opinion, you can actually set up a poll and have them rate the item that you are debating. I don't know how many times i've been buying clothes online and beforehand email my friends the pictures to get their opinions. This really is online shopping with a difference. 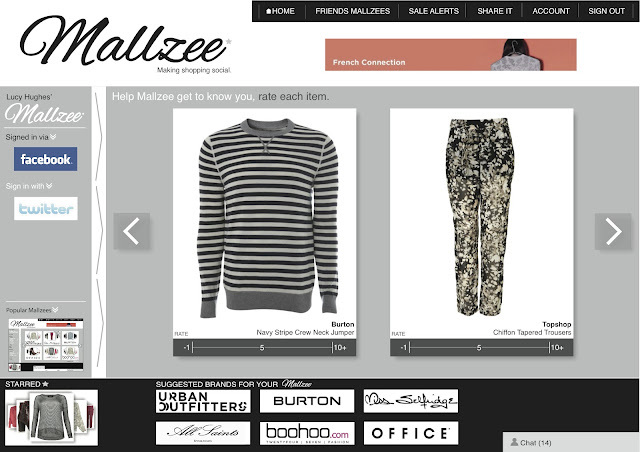 All your much loved brands can be purchased through your 'Mallzee'. If there is something you like showcased within a friends 'Mallzee' you can purchase it through their one too. I mentioned before that this experience is going to be cheaper than some other methods of online shopping - this is because discounts have already been negotiated with the top brands and stores - courtesy of the brains behind 'Mallzee'. Over 200 shopping brands have already signed up - Urban Outfitters, New Look, Feel Unique, St Tropez to name but a few. An added bonus to inviting friends to your Mallzee is that - since you are 'the owner' of your personal Mallzee, you earn money anytime anyone someone buys from you! What an incentive! I am really looking forward to trying out this new shopping experience. Mallzee are keen to get the word out about the concept before Mallzee.com officially launches later this year. If you think this is something you are interested in you can register now for a launch invite at - Mallzee.com. When you click on the link it will take you to their home page where you can enter your email address and be entered into a prize draw for £100/$155 of shopping vouchers and some other treats. Then you will be given the opportunity to share the news about the Mallzee launch with your friends through your preferred social networking sites. I look forward to hearing your views on this, feed back is appreciated. What do you think?